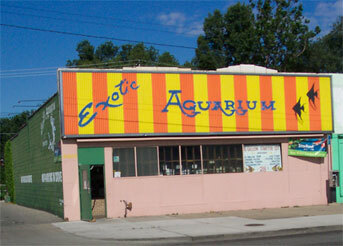 Exotic Aquarium is located on the westside of Detroit at 16865 Schaefer Hwy. near McNichols in Michigan. Map & Directions: Click Here! We carry a large selection of Freshwater Tropical Fish with over 100 tanks and a good selection of Aquarium supplies including Power Filters, Heaters, Plants and Decorations plus various Fish Foods, Medications, and related Aquarium supplies. Our helpful trained staff is available to help you from conception to completition and beyond with your Aquarium needs. Visit our Store today and check out our selection. Business Hours & Directions: Map & Directions: Click Here! At this time, Exotic Aquarium DOES NOT sell merchandise or livestock directly over the Internet. This website is set-up for local customers or interested individuals to gain more information about our store and what we we sell in our store. There are numerous commercial sites where you can buy supplies directly over the Internet. If you are not in our area, we encourage you to visit those sites to buy your Aquarium related goods via the Internet. We also offer search features and advertiser links on certain areas of our website to hopefully point you in the right direction to purchase what you are looking for. In the future, we hope to add helpful information and tutorials to help people surfing the Internet with information on how to sucessfully set-up and maintain an Aquarium. If you are visiting from another State, feel free to stop in our Store and check out one of the Best Tropical Fish stores in the M etro Detroit Area . Exotic Aquarium was established in 1951 as part of a chain of Tropical Fish stores located throughout South Eastern Michigan known as Michigan Hobby House. The chain of stores was owned by Bob & Dorthy Gooldy and included The Coral Reef (Redford), Unique Aquarium (Warren), The Aquarium (Livonia), a distribution warehouse, and of course, the flagship store, Exotic Aquarium. Although only Exotic Aquarium r emains , the original philisophy still remains, good selection, great customer service, and competitive prices. Back i n 2001, Exotic Aquarium celebrtated it's 50th anniversary of serving Metro Detroit with some of the areas best Tropical Fish and Supplies. In the Past Events area of this site, you can view photos of some of events that took place that summer. We also will feature some classic pictures of past employees from the past in that area.